What are some things you shouldn’t dump down the drain? If you use grease, fats and oils in your kitchen (and many of you do), those are all things that shouldn’t go down the drain. Grease comes from cooked and/or melted fat from various meats, like bacon, sausage and poultry. Fats can be found in things like ice cream, milk, cheese, shortening, meat trimmings, and uncooked poultry skins. Oils are all too common in things like salad dressings, cooking oils, olive oil, and mayo. When possible, throw this stuff out in the garbage rather than letting it down the drain. Speaking of kitchen stuff, some of the other things that don’t belong down the drain include coffee grounds, egg shells, banana peels, and produce stickers. All of these items can clog and/or damage drains. As for other areas of the house, such as the bathroom, please don’t flush cat litter, cigarettes, condoms, cotton balls, paper towels, or “flushable wipes” down the toilet drain. Your toilet is not a garbage disposal, so don’t use it as such. In places like the basement or garage, where there are drains sometimes, people tend to want to put paint down these drains, as well as cleaning products, and car fluids such as motor oil or antifreeze. If you don’t want problems, don’t put these often toxic things down your drains. 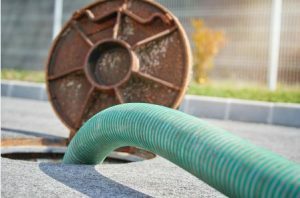 If and when your drains have problems, you may need to call Carolina Septic Pro, which does septic tank pumping and cleaning, as well as inspections, installations, and maintenance/repairs. Located in Cleveland, North Carolina, Carolina Septic Pro can be reached by calling 704-626-6622.